What you see here are the copy edits for Iron Crowned, and line edits for Last Sacrifice. They are both due in under two weeks and the one on the right is Last Sacrifice! Richelle also wrote a little bit on her Facebook page about what the different edits mean. For those curious about the manuscripts below, here's the status. IC goes through first draft, revision, copy edits, proofs, and production. 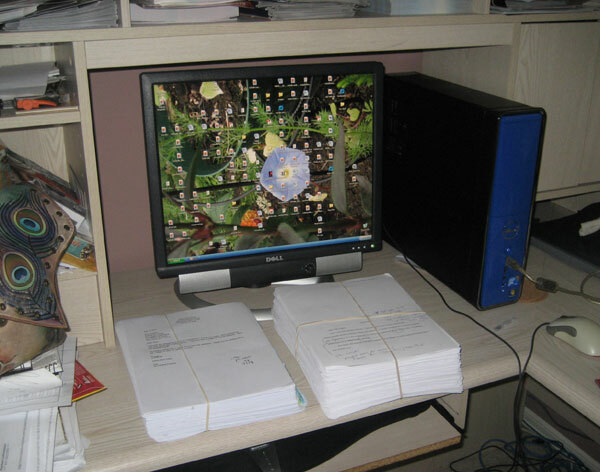 LS goes through first draft, 2 revisions, line edits, copy edits, proofs, and production. So, still a ways to go on both. Line editing is a stage in the editing process in which a manuscript is edited for tone, style, and consistency. [...] As the term “line editing” implies, a line editor literally goes through a written piece line by line, taking the time to be extremely thorough and meticulous. Line editors may read a piece several times to ensure that it has been thoroughly edited, often starting with a rough pass to look for basic issues like spelling and grammar problems and then digging in deeper with each successive pass.